British director Sir Ridley Scott has returned to the Alien franchise more than 30 years after warning cinemagoers: "In space, no-one can hear you scream". It was a terrifying tagline right up there with: "Just when you thought it was safe to go back into the water" or "From the producers of Xanadu...". But the catalyst for the new film Prometheus is not the sleek, razor-jawed H.R. Giger-designed xenomorph of the first movie and its sequels but rather a huge, unnamed figure who is only briefly glimpsed on screen. "I was thinking about it afterwards when I was doing interviews and what's interesting is that nobody asked about him," says director Sir Ridley Scott referring back to his original 1979 breakout hit. The huge figure in question has come to be known by fans as the "Space Jockey" - the lone pilot of a derelict spaceship investigated by the crew of the Nostromo - which featured Sigourney Weaver in her most famous role as Warrant Officer Ellen Ripley. The mummified figure, which looks at least twelve feet tall, sits at a set of controls with a large hole in its chest - a grim portent of the action to follow. "I watched the further three Alien movies and it never came up," Sir Ridley adds. Set around 40 years prior to the first movie, it features Girl With The Dragon Tattoo's Noomi Rapace, Charlize Theron, Michael Fassbender and Idris Elba, star of The Wire and Luther. The film takes its name from the Greek mythological titan who stole fire from Zeus and gave it to the mortal world, only to be punished by having his liver torn out and eaten by an eagle day after day for all time. It is also the name of the film's spaceship, carrying a team of scientists on a mission into deepest space to find the origins of mankind - following a map of star constellations found in cave paintings and carvings from ancient civilisations across the world. It is the fundamental question of where man came from and how we evolved, which most intrigues the 74-year-old director - whose other films include Gladiator and Blade Runner. "You go into the internet and get right into entomology, beetles, the design of underwater creatures and the more you see, the more you think, why did these evolve this way?" he says. "I think it was John Updike who said something like, 'We've been here for about three billion years, why did nothing really significant happen to us physically until about 70,000 years ago?" "Is he saying maybe there was something half a billion years ago which was a civilisation equal to ours? If you had a cataclysmic event, there would be nothing left but atoms, particles, therefore could we have existed before and if we did, who or what destroyed it. "But also, who created us and who kicked it all off again." Sir Ridley has touched on fundamental questions about humanity in his previous films - most obviously the sci-fi Blade Runner, which sees Harrison Ford hunting a gang of genetically-engineered beings seeking answers from their human creators. Other themes revisited in Prometheus question whether life exists elsewhere in the universe and what happens to us after we die. During his extensive research ahead of the film, Sir Ridley says he discovered that not even in the science world is there overwhelming agreement. "I had a really great lunch with about 12 scientists and half of them believed in God and the other half roared with laughter said: 'Cobblers'." This is reflected in the relationship between Rapace's scientist Elizabeth Shaw and her partner, who have fundamental differences in their beliefs - Shaw wears her late father's crucifix and still chooses to believe in a higher power while Holloway remains the cold pragmatist. Sir Ridley himself believes "it is getting entirely ridiculous to believe that in this galaxy we're the only lifeform". Referring to planned exploration of Europa - a moon in orbit around Jupiter, he continues: "They are sending probes into Europa, the ice giant which has water at its core and they believe could contain life. So, suddenly the whole thing's changing and now they're acknowledging that." With a budget reportedly in the region of around $130m (£84m), the new 3D blockbuster is on a much grander scale than Sir Ridley's Alien - only his second feature film - and its comparatively shoestring budget. The grimy, claustrophobic and cold-looking spaceship Nostromo gives way to a much brighter, more advanced-looking model which creates some issues. Huge leaps forward in film and computer-generated technology means Sir Ridley Scott and his production team can do much more than they could four decades ago. The ship boasts some very natty state-of-the-art hardware such as 3D holograms and projections. Though the director dismisses any perceived gap in the technology today within the confines of what he had created in 1979, saying the very nature of the film asks viewers to suspend disbelief: "We're so far in deep space that the idea of us getting out there you kind of sidestep that real question." One of the most anticipated films of the year, reviews have, so far, been mixed . 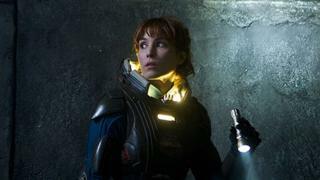 Prometheus has been released in the US as an R-rating, meaning viewers under the age of 17 will need to be accompanied by an adult. In the UK it is a 15 certificate. The film is violent and tense but Sir Ridley - who has been an outspoken critic of the current rules of film ratings - insists he cut as much he could to open the film to a wider audience. "It has to be be about the movie, so I've made concessions. There's a moment where you don't want to harm the movie. But he acknowledges its a case of simple economics and getting an 18 certificate "could be the difference of $80m or more". "It isn't real - I have monsters. Like the monsters in Lord of the Rings, for kids they were pretty scary but they got a PG-13 because their blood was black, that's rubbish".